The slots are some of the most popular games in existence. There are practically thousands of them right now on the internet. And there are millions of players that enjoy them. A thing that you will need to know is that there are many different kinds of symbols in the slots. 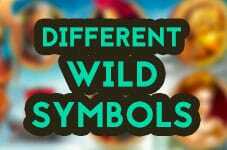 And one of the most widely used symbols is the Wild symbol. Below you will get to learn about the most widely used wild symbols. The shifting Wild symbol has a special feature. It’s one that will shift one position, typically to the left. Many slot games feature this form of symbol. Typically, the shifting wild symbol starts on the ends of the reels. Then it moves to the opposite side until it finally leaves the screen. The wandering is very similar to the shifting. The difference here is that the wandering can pick any direction to move in. They don’t move in a rigid fashion from one end to the other. As you can see, the names of the Wilds are pretty self-explanatory. And such is the case with the sticky symbols, too. The main feature of this particular kind of wild symbol is that it sticks on the reels. And it can stick for one additional spin – or for several additional spins. This is a fan favorite as it can give the players a chance to win a lot of money. The trailing Wilds are also highly popular. Their name says it all. They leave a trail of additional symbols as they appear. In this way, they can cover the entire reels with these symbols. And the players will benefit greatly by this. Finally, there are expanding Wild symbols. If one symbol falls into a particular slot on the reels, it will expand. Typically, the expanding wilds cover only one reel. And this is still more than enough to make you a big winning combination. We have gone through some of the most popular and important Wild symbols in online slots. Slot developers are up and about on the mission to create new Wilds. And newer and more exciting are continually coming up. They will be the subject of another article in the future.